It is no joke to write articles, churning out letters and phrases on demand and oftentimes with strict deadlines. Lots of coffee and an assortment of bread have been my comfort food and keeps me company until the wee hours of the morning when the world around me settles down and I, at last find peace and quiet without being interrupted by the ringing of the phone or by grandchildren who think it is their right to visit Nanna at any hour. I have always been a gifted cook but without someone to cook for anymore, I have relied mainly on take outs and bread to keep me sustained. When I read about the Zojirushi Home Bakery Supreme® Breadmaker BB-CEC20 I promised myself I’d get one. It will be a pleasant break to get dirty and forget the computer for brief spells, not to mention the delight to cook and eat with my growing grandchildren. We are particularly fond of fresh loaves of bread lavishly spread with store-bought mango jam or guava jam. Zojirushi Home Bakery Breadmaker BB-CEC20 has room for baking a large 2 lb. loaf. It is also capable of cooking other types of bread and has menu courses for cake, sourdough starter, dough and even meatloaf. The Sour Dough Starter feature produces a light sourdough starter after 2 hours. 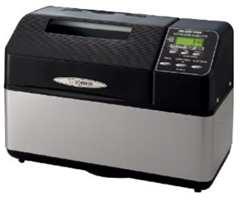 These features make the Zojirushi Breadmaker BB-CEC20 a most versatile appliance and in my opinion the best in its class of kitchen equipment. This small appliance which can be placed on most countertops is so versatile that it can be made to cook not only the 2 lb. traditional rectangular bread but dinner rolls, garlic bread sticks, cinnamon-raisin bread and even savory dishes like homemade meatloaves, strawberry jam for dessert or a chocolate cake and other kinds of cakes and pastries. Zojirushi Breadmaker will bake a spectacular rectangular-shaped two-pound loaf from a basic bread recipe. The measured ingredients should be simply added in, the lid closed, a selection chosen from the easy-to-understand and operate LCD control panel and your perfect loaf will be ready in about 2 hours. There are three types of crusts to choose from: dark, medium or light. There are also 10 settings that have been pre-programmed for most bread recipes: Quick, Quick Dough, Quick Wheat, Basic, Basic Dough, Basic Wheat, Cake, Sour Dough Starter, Jam and Home Made. The user manual that comes with the machine has a section containing a variety of recipes for cooking with the Breadmaker. 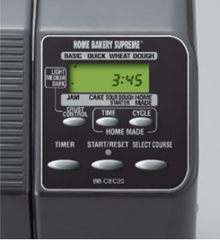 One of the most wonderful features of the Home Bakery Supreme is its machine timer that can be set for 13 hours, so that the end of the baking cycle can be delayed until you are ready to wake up and smell the wonderful aroma of homemade, freshly baked bread. Those who go to the office or on errands can set the timer in time to come home to enjoy a home baked warm loaf. Zojirushi Home Bakery Supreme® Breadmaker BB-CEC20 features a home made menu function exclusive with Zojirushi Breadmakers with three memory settings and a large window for viewing the cooking bread inside. Its LCD control panel is user friendly and easy to understand and operate with a start/reset button. The “on” indicator light alerts you to check on your cooking progress. The appliance comes with a 2 pound loaf pan for traditional breads, dual kneading blades and an eight ounce measuring cup and measuring tablespoons and teaspoons. The removable bread pan has a non-stick surface for easy cleaning. The dual kneading blades make kneading easy and thorough resulting in a higher rise. Home Bakery Supreme Breadmaker is a durably built small appliance measuring 9-5/8 inches by 17 by 12-1/5 inches weighing a total of 9 pounds. Its electrical rating is 700-watts / 120 volts and sold in White or Black. It can be ordered from Amazon.com boxed or gift-wrapped. Shipping Weight is 20 pounds. 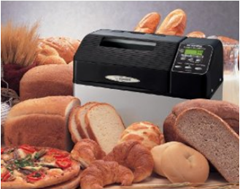 There were 355customer reviews for the Zojirushi Home Bakery Supreme® Breadmaker BB-CEC20 in Amazon. This small appliance garnered 4.4 out of a possible 5 stars. Those reviews stress the machine’s quietness, ease of cleaning up, great loaf (if follows the directions and the recipe), being verstile to make different types of bread. Always baked perfect. Love the machine. I am an avid bread maker. this is my third machine. I hated to spend the money — seems absurd to pay that much — but it is amazing! No comparison with typical machines. The Zo makes a horizontal, 2 lb loaf and has two mixers. It makes an outstanding loaf of bread, better than we’ve ever had before. The Zojirushi is much, much quieter in operation. Very quiet, in fact, which is much appreciated. We no longer buy hamburger and hotdog buns either. This MAKES a burger as the taste of homemade buns has no equal, even if it’s a portobello burger it takes good! Some reviews said that the bread quality is not great. However, I do not think you should hesitate and change your mind. First, like other positive reviews highlighted: if you follow the direction and the recipe and measure the ingredients properly. Second, if you want a good recipe book with this machine, you can try The Bread Lover’s Bread Machine Book by Beth Henperger. It costs you about 13 bucks for Kindle version, and you will never fail to bake a high quality bread! I highly recommend Zojirushi Breadmaker BB-CEC20 and do not think you should change your mind because of very few negative reviews. The positive reviews still outnumber the negative reviews. 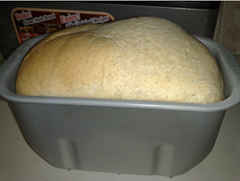 The loaves with low fat margarine I have made with the Zojirushi Breadmaker turned out great. It is a joy to smell that yeasty aroma of cooking bread every time.